Coyotes have become common in Westchester, and are likely on their way to Long Island. Long Island is one of the few places in the United States where coyotes are not regularly seen, and researchers in New York City believe it’s just a matter of time before these wild dogs become a common sight here. The organizers of the Gotham Coyote Project, which documents the lives of coyotes in New York City, are working on a new project called Wild Suburbia to help Long Islanders document the presence of coyotes, bobcats and foxes here. Wildlife biologist Dr. Chris Nagy gave an overview of the project to attendees at the Long Island Natural History Conference at Brookhaven National Laboratory in March. Two sightings of a lone coyote have been documented in the past two years near farm fields in Bridgehampton and Water Mill, and residents of Fishers Island have been hearing them howl for years, and have taken to keeping their cats indoors to keep them from being eaten by coyotes. Dr. Nagy said he’s not surprised to hear about these sightings. A lone coyote has been living in a park in Queens since 2009, and his research team has captured video for several years of coyote activity in the Bronx. They’ve even become common in Westchester. One lone coyote was even seen this week on the roof of a bar in Long Island City. Dr. Nagy said there are two distinct routes that coyotes took when heading east from the western plains — a route across the southern United States, and a route over the Great Lakes and through Canada, where they might have bred with wolves. Dr. Nagy said these northern coyotes are 30 percent larger than the original population, and it’s these larger coyotes that have populated the New York metropolitan area. He said he believes it’s quite feasible that a coyote who made its way through New York City could have walked the length of Long Island and ended up in Bridgehampton in a couple weeks. “I’ve never bet against coyotes colonizing a place,” he said. Dr. Nagy said the purpose of the Wild Suburbia Project is to “have as many eyes on the ground as we can” to document the movement of coyotes on Long Island. He hopes residents of Long Island log in and document the absence of coyotes if they don’t see them here now, because the documentation of their absence will be as useful to scientists as the documentation of their presence when they arrive. Wild Suburbia is also documenting the population of Long Island foxes, in an attempt to see what happens to their population when the coyotes arrive. Dr. Nagy added that people don’t need to fear coyotes — he pointed to statistics that domestic dogs bite 4.5 million people and cause 34 deaths each year, while 450 people die each year falling out of bed and vending machines cause two deaths per year. Feeding coyotes is asking for trouble. He said 142 coyote attacks against humans were reported between 1960 and 2006 — mostly in southern California — but only two human deaths have ever been attributed to coyotes. Coyotes are primarily nocturnal, and don’t approach humans unless they’ve been fed and become accustomed to human interaction, which wildlife biologists strongly discourage. 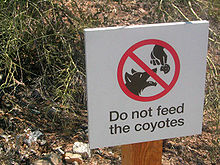 They also discourage feeding or leaving your pets outside in areas where coyotes are present. “They like to stay away from humans,” said Dr. Nagy. A year ago, I spotted a dead coyote on the Cross Island Parkway just north of the interchange with the LIE. I’m a licensed wildlife rehabber, and I realized it was a coyote and not a dog due to the ears, snout, and legs. I called Gotham; they sent someone to retrieve it, and I later found out that I was correct. The belief is that it was living somewhere in the vicinity of the Alley Pond Environmental Center. Wow,thank you Nancy! That’s very interesting! Don’t they attack small dogs in outdoor yards? i was out at Robert Moses beach field 2 tonight stargazing & I saw a lone coyote about 15 feet from where I was sitting. It stared at me for like 30 seconds until it ran up over the dunes when I pressed my car key lock button on my key ring & flashed my lights to make it run away. Never been that close to one before so I didnt know what to expect.